Panel I: How Can Rio+20 Foster the Global Development Agenda? With the much-anticipated United Nations Conference on Sustainable Development just a month away, and with intergovernmental negotiations on an outcome mired in minutiae, United Nations Secretary-General Ban Ki-moon called today for ambitious leadership to seize this “once in a generation opportunity” to transform ideas and aspirations into bold action “for the sake of our planet and our children”. “We do not have a moment to waste”, the Secretary-General said, opening the General Assembly’s informal thematic debate convened to re-energize talks on possible outcomes of the Conference — known as “Rio+20” after the Brazilian city that will host the event from 20 to 23 June. The debate, “The Road to Rio+20 and Beyond”, featured two round-table discussions dealing with issues at the heart of the Rio process, including ways the event could foster the development agenda, the Assembly’s role in supporting its objectives, and effective ways to implement any agreements reached. “The world is watching. The media are focused. People — young and old — are demanding action,” Mr. Ban said. “Yet the current pace of negotiations is sending all the wrong signals. We cannot let a microscopic examination of text blind us to the big picture”, he continued, saying the negotiators must seize the opportunity to forge agreements on vital thematic issues: decent jobs; food security and sustainable agriculture; clean, efficient energy sources; access to safe drinking water and sanitation; conservation of the world’s oceans; and progress in defining sustainable development goals that built on the Millennium Development Goals. In his opening remarks, Assembly President, Nassir Abdulaziz al-Nasser, said that, after months of deliberations, “We are close; close to a once-in-a-generation opportunity to define the future of the 7 — soon to be 9 — billion people living on our planet.” He thanked Member States for their collective efforts thus far, but with an international consensus emerging, more must be done. “Creative solutions are needed to get people back to work. Growth must resume. Only a dynamic economy can cope with the challenges of transitioning to a more sustainable model of development,” he said. With delegations from all over the world set to gather in New York next week for the final round of informal negotiations before heading to Rio, there were still crucial decisions to be made, he said. Today’s debate was intended to shed further light on two important areas that had emerged thus far: the sustainable development goals; and the institutional framework for sustainable development. “If we want to have a positive impact on the development agenda post-2015, the Rio outcome should be framed around the three dimensions of sustainable development, the principle of equity and common but differentiated responsibility,” he said. Further, Rio+20 could make a significant contribution to the United Nations development agenda without distracting from efforts to achieve the Millennium Development Goals. And while Rio offered a timely opportunity to tackle all the interlinked concerns, poverty reduction and progress in sustainable development should remain at the heart of a new post-2015 framework. As for a strong institutional framework, he said the outcome must establish architecture that promoted better integration of sustainable development’s three dimensions — economic, social and environmental protection. In the end, Member States should focus on “must haves”, rather that what would be “nice to have”. 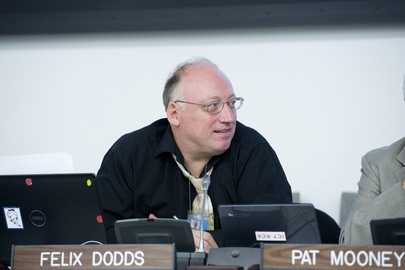 “We need to ensure that the words on the pages of the Rio+20 outcome document have meaning. Our planet and its peoples are counting on us,” he said. Picking up that thread, Luiz Alberto Figueiredo Machado, Under-Secretary-General for the Environment, Energy and Science and Technology of the Ministry of External Relations of Brazil, said that the world faced challenges regarding all three of those dimensions. In the environmental area, there were climate and biodiversity crises, financial turmoil in the economic sphere, and widespread unemployment and other crises in the social sphere. That was partly the result of a model that was unable to cope with such crises and might even be generating them. Protectionist measures and other constrictive strategies were part of that model and repeated past mistakes. Investment should be made in growth, education and other areas, through a long-term focus on sustainable development. “There are no easy journeys to that goal, but business as usual is no longer a choice”, he said, adding that there were different paths to sustainable development. As such, Rio+20 would build on its historic predecessor, the 1992 Earth Summit, but from a different perspective. Yet, the results of that earlier conference, especially its landmark action plan, known as Agenda 21, remained remarkably contemporary. There must be “no retreat” from its principles, he said. Civil society participation was key to the process to ensure that, as poverty was eliminated, future generations — and a growing world population — were accounted for. Commitment to the full achievement of the Millennium Goals must be renewed within that framework, to help shape “the future we want”. Kim Sook, Co-Chair of the Bureau for the United Nations Conference on Sustainable Development, affirmed that a heavy responsibility fell on the international community to set things right for this generation by making the right decisions. “We cannot afford empty words”, he added, urging that the outcome text be looked at critically as a guiding document for the next 20 years. Essentials must be concentrated on which, with good governance, political will and other necessary factors could achieve the best future for the generations to come. A good, quality outcome document would be a crucial indicator of the success of the Conference. “This is the most important and critical month in our long voyage”, he said, calling for a spirit of compromise to produce a streamlined, action-oriented text. “Let us get the job done, so that our Heads of State and Government can proudly show the results and contribute to a better future for all,” he said. Throughout the day-long debate, experts and diplomats alike urged agreement on an outcome that was “ambitious” but “concise”, and which addressed a range of concerns, including decent jobs, energy, sustainable cities, food security and sustainable agriculture, water, and oceans. Yet, Jeffery Sachs, Director of the Earth Institute at Colombia University, was among those stressing that all the details of sustainable development did not need to be resolved at Rio. “That’s impossible, because many of them require local planning and decision-making,” he said, urging negotiators to see sustainable development not as “an event”, but an ethical approach to policymaking. Following such a path, Rio+20 could place sustainable development at the core of the global agenda by adopting a set of “sustainable development goals”. that left the General Assembly to drive the transition to fair sustainable development and monitor follow-up Rio+20 commitments. He also said that, by the end of the year, the Assembly could establish a United Nations agency for environmental sustainability, and a proposal for a high commissioner/ombudsman for future generations could be discussed in the next Assembly session. "The United Nations offers us a place to be touched by the better angles of our nature. Rio, Beijing+20, the SIDs review, the MDG review and habitat 3 offer a coherent opportunity for the development of a new global narrative on how we might live together on this small planet - after all its 'Only One Earth' we have. It should be remembered that indeed, what ‘Happens on Monday’ when people return to their capitals, to their communities, to their work places after Rio, is as important as what happens at the Summit. ‘The Future we want’ hangs in our hands and our decisions – let us work to make the legacy of Rio something we all can be proud of."